SEATTLE, Washington, December 6, 2011 (ENS) – The global conservation organization WWF and Coca-Cola, the world’s largest beverage company, have partnered to conserve polar bear habitat in the High Arctic. Last night in Seattle the campaign was introduced at one of seven such events being held across the United States this holiday season. By selling specially designed white cans of Coca-Cola imprinted with polar bears and white caps of bottles of its other beverage brands, the company intends to draw attention to the Arctic Home campaign and raise money to fund it. Coca-Cola is making an initial donation of $2 million to WWF and inviting its customers to donate. Customers are asked to text the package code to 357357 to donate $1 to WWF. They also can donate online at ArcticHome.com. Coca-Cola will match all donations made with a package code by March 15, 2012, up to a total of $1 million. 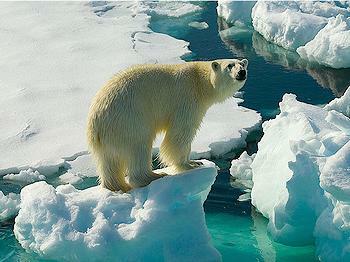 The proceeds from the Arctic Home campaign will fund a WWF project called the Last Ice Area. This area where summer Arctic sea ice is predicted to persist the longest in the face of climate change is in the northeast Canadian High Arctic and northern Greenland. Polar bears need sea ice to survive because ice is the habitat of the ringed seals and bearded seals that are the bears’ preferred prey, says WWF-Canada Arctic conservation biologist Pete Ewins, who attended the Seattle event. Ewins says what is needed is to create an area covering some 500,000 square miles with different zones of protection rather than “the current paradigm in the U.S. and Canada,” a rush to exploit natural resources. Some of the core areas will be off-limits to oil and gas development, other areas would be off-limits to vessel traffic and other human activities, which are increasing as the Arctic warms. WWF is already in discussions with the eight governments on the Arctic Council, where the conservation organization has been a permanent observer for 20 years, providing input to the council’s relevant working groups. The lead Inuit organization, the Inuit Circumpolar Council, is facilitating discusssions on treating this area as special, given the predictions on climate change that foresee the melting of summer sea ice across much of the Arctic by 2050, said Ewins. To dramatize the plight of the polar bears, a new IMAX film is being created for the giant screen by MacGillivray Freeman Films, based in California. Arctic Home TV commercials and website content feature sneak preview footage from the film, “To The Arctic 3D,” which is scheduled for release in IMAX theaters in 2012. The film tells the story of a mother polar bear and her two cubs as they try to survive on the shrinking sea ice. View clips at www.arctichome.com. “To The Arctic 3D,” is the first film presentation of One World One Ocean, a multi-year, multi-platform nonprofit campaign established by company founder Greg MacGillivray to spark a global movement to protect the world’s oceans.